Brahms, Johannes (1833-1897), German composer, one of the major composers of the 19th century, whose works combine the best of the Classical and Romantic schools. Brahms was born in Hamburg on May 7, 1833. After studying the violin and cello with his father, a double-bass player in the city theatre, Brahms mastered the piano and began to compose under the guidance of the German music teacher Eduard Marxsen, whose conservative tastes left a lasting imprint on him. In 1853 Brahms went on a concert tour as accompanist to the Hungarian violinist Eduard Rem�nyi. In the course of the tour he met the Hungarian violinist Joseph Joachim, who introduced him in turn to the German composer Robert Schumann. Schumann was so impressed by Brahms's unpublished compositions that he wrote a wildly enthusiastic magazine article about him. Brahms cherished a deep affection for both Schumann and his wife Clara Josephine Schumann, a famous pianist. The friendship and encouragement he received from them gave impetus to his work. Many biographers contend that Brahms was deeply in love with Clara, but he did not propose to her after Schumann's death in 1856, and he never married. In 1857 Brahms secured appointment as conductor at the court theatre in Detmold, where he remained until 1859; for several years thereafter he travelled in Germany and Switzerland. His first major work to be publicly presented was the Piano Concerto No. 1 in D Minor, which he performed in Leipzig in 1859. The composition was not well received, however, because it lacked the showiness and the virtuoso passages then in vogue. The composer went to Vienna in 1863 and became director of the Singakademie (Choral Academy) but left the post a year later. In 1868 Brahms won fame throughout Europe following the performance of his German Requiem, so called because the text is taken from Luther's German translation of the Bible rather than the Latin texts normally used. The piece, cast in seven divisions, focuses on the sorrow of those who mourn, rather than speculating on the fate of the dead. Brahms settled in Vienna in 1871, accepting the directorship of the Gesellschaft der Musikfreunde (Society of Friends of Music). In 1874 he resigned his position to devote himself to composing. Until 1873 Brahms had written chiefly for the piano, the instrument he knew best, and for chorus and orchestra (and he continued to write piano music until the end of his life). In that year, however, he produced the Variations on a Theme by Haydn, scored for full orchestra. Demonstrating Brahms's increasing mastery of large orchestral form, the Variations presaged his major works, which are among the finest expressions in all music literature. His masterpieces include the grandiloquent Symphony No. 1 in C Minor (1876); the gentler, more mellifluous Symphony No. 2 in D Major (1877); the Academic Festival Overture (1880), incorporating German student songs; the sombre Tragic Overture (1881); the poetic Symphony No. 3 in F Major (1883); and the Symphony No. 4 in E Minor (1885), with its brilliant and emotionally overwhelming finale. All these works display a tightly knit structure, stemming from the Viennese Classical tradition. 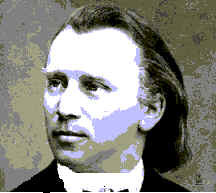 Unlike his contemporaries, Brahms shunned exploitation of new harmonic effects and new tone colours for their own sake. He concerned himself rather with creating music of inherent unity, utilising new or unusual effects only to enhance internal structural nuances. Thus, his best works contain no extraneous passages; each theme, each figure, each modulation is implicit in all that has preceded it. The Classicism of Brahms was a unique phenomenon in its day, entirely at odds with the trends in contemporary music as represented especially by the German composer Richard Wagner. Although Brahms revived a tradition to which no important composer since Ludwig van Beethoven had adhered, he was not wholly isolated from his own milieu, and the fiery emotional range of the Romantic spirit permeates his music. Unfortunately, little is known of Brahms's methods of work. A merciless self-critic, he burned all that he wrote before the age of 19 as well as some sketches of later masterpieces. It is known that he frequently reworked pieces over a period of 10 to 20 years, and before achieving the final form he often transcribed them for several different combinations of instruments. Brahms wrote in every medium except opera. His numerous other important works include Schicksalslied (Song of Destiny, 1871), a musical setting of a poem by the German poet Friedrich H?lderlin, scored for chorus and orchestra; the Violin Concerto in D Major (1878), a classic in the violin repertoire; 3 string quartets; 5 trios; a clarinet quintet; numerous other chamber works for various combinations of instruments; and more than 150 songs. Brahms died on April 13, 1897, in Vienna.